Though I do admit, an episode in which the Doctor and his companion go to visit Elvis could definitely be entertaining! Belated congrats to Kavya Shivashankar, winner of the 2009 National Spelling Bee— and, for that matter, to everyone else who made it into the Bee, as that alone is a major achievement. You all definitely weren’t Laodicean about spelling, that’s for sure! And since I forgot to post this after the 2008 bee, extremely belated congrats to Sameer Mishra for winning a great guerdon in that year’s bee. Edited to add: Oh, yeah, I forgot! Special thanks to the Spelling Bee staff for throwing in “blancmange” as a word this year. As a fan of Monty Python’s Science Fiction Sketch, I salute you; indeed, I even suggested the word on my blog three years ago. For those who’ve come here looking for the Forums section that used to be on my site, I’ve closed it— there wasn’t enough interest in it; the one section that did get posts (“Music in Commercials”) served the same purpose as Adtunes.com, which I also participate in; and besides, I’ve been so busy with grad school and side projects that I haven’t had much time for moderating/keeping up the forum. I may be opening a new one in the future, but for now, I feel it’s best to close it while keeping the archives up in a read-only form for browsing. Those can be found here, for those who need it. Google Image Search, and yep. That is, in fact, Seth Meyers. The un-Photoshopped original frame from Weekend Update even shows up in the search results. So I was at the ATM today, wanting to withdraw $20 for a quick lunch. 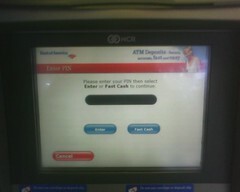 I went up to the ATM, inserted my card, and, as usual, saw the following screen. First of all, if you’re not familiar with what a garden path sentence is, go read the Wikipedia article on them. I had to read that two or three times before I realized it had nothing to do with little people starring in Obama ads. Now that the entirety of Google’s Android phone OS has finally been released under the Apache license, I have modified the Droid Sans Mono font so as to include a more easily distinguishable zero, for the benefit of my fellow programmers. I thought it was a great-looking font for the most part, but the vague distinction between 0 and O simply wasn’t good for peering through long listings of program code. So here is the modified font, which I have named “Code Sans Mono Z”. I had originally named it “Droid Sans Mono Z”, but there were potential trademark issues with my using the Droid name, hence the change. 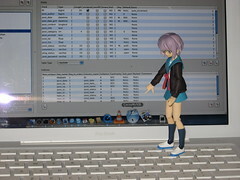 So naturally, I had to have her posing in front of a MySQL administration interface. I am truly a complete and utter geek. I was cashing in some savings bonds earlier today at a bank which shall remain unnamed, and noticed a rather serious oversight in the design of the form they used for this task. The form was one of those where they give you a limited number of character spaces to write things; I assume it’s because their database was originally designed with certain arbitrary field lengths. There was an 11-character limit on the ‘city’ field. I have family in Warner Robins, GA; Milledgeville, GA; and Jacksonville, FL. Oh, and should I mention this is a large bank that formerly had headquarters in San Francisco?